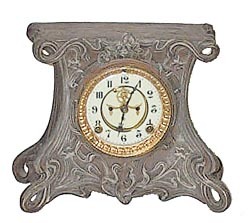 Ansonia Clock Co. mantle clock, "Mironda", ca 1904. Usually found with a seated statue on top, but it is not necessary. 8 day, half hour gong strike, running. 2 piece porcelain dial, French sash, and beveled glass, are all very nice. Finish looks like it was Syrian Bronze originally, needs to be refinished. Ly-Ansonia No.1505.